Dr Bob Robinson has written this review for Laidlaw College. "In recent months I've been selling or giving away dozens of copies of what I think is the best book that explains and defends the faith for Kiwis. 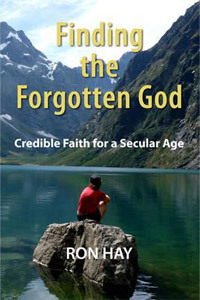 The book is Ron Hay's Finding the Forgotten God and the 2015 winner of the Ashton Wyllie prize for the best NZ book on spirituality. The tone is distinctively Kiwi - from the lovely cover to its many NZ allusions. I like its intellectual honesty (both the 'calamity of creationism' soundly spanked and the new atheists neatly deconstructed) and there are none of the embarrassing dimensions found in much popular apologetics. The wide research behind the book is tellingly applied even as the style remains clear and appealing. Secular people are unlikely to buy (or even see) this book - so they need to receive it from someone who cares enough to offer it with ongoing prayer and an invitation to talk further. What could be easier than placing this pleasant-to-look-at, readable and 'no-cringe' outline of the Christian message into the hands of our non-Christian friends and family? Buy, read, give and pray!"